Sabari Terrace: An end to water woes? 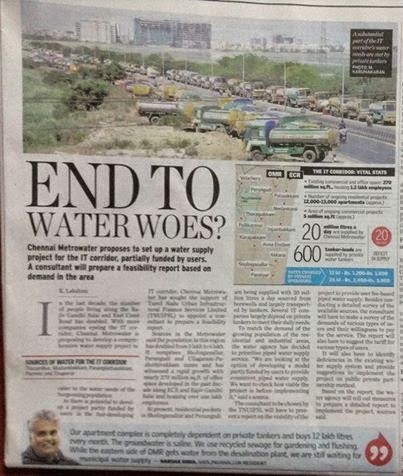 An end to water woes? In the last decade, the number of people living along the Rajiv Gandhi Salai and East Coast Road has doubled. With more companies eyeing the IT corridor, Chennai Metrowater is proposing to develop a comprehensive water supply project to cater to the water needs of the burgeoning population. As there is potential to develop a project partly funded by users in the fast-developing IT corridor, Chennai Metrowater has sought the support of Tamil Nadu Urban Infrastructural Finance Services Limited (TNUIFSL) to appoint a consultant to prepare a feasibility report. Sources in the Metrowater said the population in this region has doubled from 3 lakh to 6 lakh. It comprises Sholinganallur, Perungudi and Ullagaram-Puzhuthivakkam zones and has witnessed a rapid growth with nearly 270 million sq.ft. of office space developed in the past decade along ECR and Rajiv Gandhi Salai and housing over one lakh employees. At present, residential pockets in Sholinganallur and Perungudi are being supplied with 20 million litres a day sourced from borewells and largely transported by tankers. Several IT companies largely depend on private tankers to meet their daily needs. To match the demand of the growing population of the residential and industrial areas, the water agency has decided to prioritise piped water supply service. “We are looking at the option of developing a model partly funded by users to provide consistent piped water supply. We want to check how viable the project is before implementing it,” said a source. The consultant to be chosen by the TNUIFSL will have to present a report on the viability of the project to provide user fee-based piped water supply. Besides conducting a detailed survey of the available sources, the consultant will have to make a survey of the demands of various types of users and their willingness to pay for the service. The report will also have to suggest the tariff for various types of users. It will also have to identify deficiencies in the existing water supply system and provide suggestions to implement the project on public private partnership method. Based on the report, the water agency will roll out measures to prepare a detailed report to implement the project, sources said. As owners / residents of Sabari Terrace we invite you to join this mailing list to enable us to update you on the happenings. Sabari Terrace Apartment Owners Association. Picture Window theme. Powered by Blogger.